1- my daughter may only weigh about a pound, but she has the cuuuutest clothes and shoes. I’m so excited to dress her! 2- it still feels SO strange to say ‘daughter’. This week has gone by so quickly! And it’s been oddly hilarious. On Friday, we went on a date for our anniversary to a local restaurant with an all-you-can-eat gyro bar and sat in the patio. I fully believe food ALWAYS tastes better when eaten outside. After we were done eating and were sitting, talking and enjoying the weather, Ben saw his chance and took off running, escaping the patio through a narrow opening in the gate! Brandon jumped into action with his quick realization that I wouldn’t (a) be fast enough to catch Ben, and (b) wouldn’t be able to fit my belly through the tiny slit in the fencing! (Both very true.) I couldn’t stop laughing after he caught him. The whole situation happened so quickly and I’m sure provided plenty of entertainment to passers by! How are toddlers so darn quick?! Also, there has been MORE baby proofing being done in our home this week. We literally haven’t stopped locking and moving things for over a year now. Nothing is safe, and just when we think we’re done, Ben discovers something new (AKA dangerous and/or fragile). At this point, I’m not sure if I’ll ever be able to decorate again, but, rest assured, there has NEVER been a home as safe as ours is right now… I can almost guarantee it. Although he appears to be lending a helping hand, Ben is carefully taking notes on how he will break into this drawer later. As Baby Girl has been flipping around in my belly, Ben has also started doing “flips” all around the living room. He’s never even seen anyone do one, but has somehow discovered on his own that he can do somersaults, will do them anytime you ask, and is really good at them at only 20 months old. How?! It’s so impressive! He also poses and smiles when he wants his picture taken (usually with Jack) and will bring me my phone if I don’t have it nearby when his perfect photo opportunity strikes. He couldn’t be any more like me, which I equally love and am terrified by. How big is the baby? About 12 inches long and 1 pound! My pregnancy app said she is about the size of a Guinea pig, which made me laugh. Maternity clothes? Yes, give me all the stretchy! Sleep? Extra amazing this week, as long as I don’t have to roll over. The cooler nights mixed with us all going to bed earlier has been perfection. Best moment this week? We had a great playdate with new friends on Thursday that really filled up my cup. Cravings? Still peanut butter and chocolate anything. Labor signs? I started noticing some Braxton Hicks contractions this week. They aren’t painful, just a little uncomfortable. I’m taking them as a reminder to take it a little easier. What I miss? Brandon. He’s been picking up extra hours lately, so we’ve been seeing him less, but I’m so proud of him and how hard he works for our family. I’m thankful it’s only temporary! Downfalls? So. Emotional. Gah, I can’t even stand how stereotypically teary I’ve been, like every pregnant woman in every movie ever. I don’t remember being like this during my first pregnancy. For example: I have ZERO idea why, but I’ve cried everytime I’ve seen a marching band this pregnancy. At first, I thought it was just a weird hormonal coincidence mixed with bad timing. But guys, between parades and other events around town, I’ve seen a marching band perform on four seperate occasions since becoming pregnant and it hasn’t failed. I wasn’t even in my high school’s marching band or anything sentimental that would lead me to bawl like a baby, but here I am, the weirdo with the big belly that’s wiping away tears as the trumpets pass by– Every. Single. Time. 😭🤣 So embarrassing! Currently listening to: a great podcast series called RISE Together. Recommend! Milestones: Ben saw a baby on a commercial, came over and lifted my shirt, pointed to my belly, and said “baby!”. It was so special because he put it all together on his own, and it really felt like he *might* be starting to understand what’s going on?! What I’m looking forward to? Finishing up some cosmetic home projects Brandon and I have started. I’m so excited about how they’re turning out! I’ll be SIX MONTHS pregnant with our little girl starting Friday! I can’t believe that. Maybe it’s because we waited so long to share our big news with the rest of the world, but it feels like I just found out! My belly is getting bigger by the day, and her little fluttery kicks have turned into big thumps, usually on my bladder. I’m loving every one of them! Exciting news: we think we have decided on her name! Keeping it a secret until her arrival, though. Here is a list of pregnancy questions/ prompts I found that I thought would be fun to share! I’ll try to do these every week or two! If you can think of any funny or interesting prompts, I’d love to add them to my list! How big is the baby? About the size of a carrot… 10.5 inches long and weighing almost a pound! Maternity clothes? When I go somewhere and need to look decent. Otherwise, it’s Brandon’s shirts and my running shorts, which are even starting to be a little snug! Sleep? Sleeping great, other than Ben’s recent switch from two naps/day to just one, and therefore a current little sleep regression to go with it. HELP! Labor signs? None, thankfully! Little Miss still has lots of growing left to do! Belly button in or out? It’s currently flat, but threatening to pop at any time. It’s noticeable under my shirts! What I miss? Sleeping on my belly. I am glad I was able to up until a week or two ago, but I’ve always slept best that way. Currently listening to: The new Jason Mraz album. It’s so dreamy! Ben and I have dance parties to it in the kitchen! Noticing anything different? My nose has been super sensitive this whole pregnancy, but it seems way worse this week, particularly to everything that smells bad. I’m declaring it time for the fall candles! What I’m looking forward to? FALL EVERYTHING! Most of my maternity clothes are fall/winter, and I can’t wait until it gets a little bit chillier so I can wear them. Bump? Oh yes, no hiding it now! I hope this post finds you well and enjoying the summer sun! In case you didn’t know, you probably do after reading the title… Brandon and I are expecting baby # 2! We are over-the-moon excited about this news, but I had to wait to post this because we have been keeping it a secret from our families for THREE months! Now that the news is out, and I’m officially pushing through my second trimester, I thought I’d share how I survived the first one. Because let me tell you, it was HARD. I’m not exaggerating when I say that I’ve never been more exhausted in all of my life. I’m thankful Ben is still taking 2 naps a day, because some days, I had to too (definitely at least one, or I wouldn’t have made it through most days). Unlike in my first pregnancy, where I was working back-to-back 12 hour night shifts AND picking up overtime day shifts, working on our kitchen renovations, and going to CrossFit 5-6 days a week during the first trimester, this pregnancy has been full of going to bed early, being nauseous all day with no appetite, and resting as much as Ben will let me. It’s funny how life has changed in two short years. I was so active, determined to have a fit pregnancy last time. That still sounds great, but this time around, the thought of going for a run makes me need a nap so desperately. Thankfully, much of my energy has come back with the start of my second trimester, and I’m hoping to work out again soon. But for now, I’m listening to my body. The demands of taking care of the house and my very spirited toddler are how I’m staying active. Here are my most helpful tips on surviving that difficult first few months when you need to be a mama first. Tip #1: Small snacks and bubbly water. I don’t know why people refer to it as “morning” sickness, when it really lasts all day long. When you’re feeling yucky and your appetite is nonexistent, it’s best to keep something small in your stomach at all times. That really helped me to keep nausea at bay, since I found I felt my worst when my stomach was totally empty. Instead of eating 3 large meals, try eating 5-6 smaller ones, and always keeping snacks around. I also drank lots of LaCroix, which is carbonated water with natural flavors. It helped to keep me hydrated when even water didn’t sound very good. Brandon was so helpful and understanding of how terrible I felt. As soon as he got home from work, he’d step right into Dad duty so I could rest, cook dinner, or some days, take a nap. It’s okay to ask for extra help. Your body is going through so much, and a little break could keep you from totally breaking. Tip #3: Celebrate ALL Victories. Every ultrasound, every new week, every load of laundry folded deserves a reward. Take it easy on yourself, and celebrate even the smallest of victories. Reward yourself with a little treat, a face mask, a solo trip to Target, or even an early bedtime. Growing a human deserves some recognition, Mama! That’s multi-tasking at its finest! Tip #4: Diet is KEY. Cravings are REAL. Aversions are REAL. But try to remember that whatever you eat, your growing little baby is eating, too. Since working out hasn’t been in the cards for me much (yet) this pregnancy, I’m working on focusing on what I can control, which is what I eat and how much I’m eating. You aren’t actually eating for two whole people, so most doctors recommend only upping your calories by 150 during the first trimester. That could be used on 2 Oreo Cookies, or you could enjoy something filling and nutritious instead, like some rice and veggies that will help you power through your day. (And really, who can stop at just 2 Oreos?! NOT ME.) Also, don’t drink you calories! Protein is also really important, so I’ve been fitting it in throughout my day wherever I can. I’ve been choosing eggs over a bowl of sugary cereal, chicken with my salads, or a protein bar snack. Comparing my diet thus far with my first pregnancy, I really believe this is the main contributor to the reason I’ve been able to successfully keep my growing belly relatively small and hide-able for months (and fit into a bridesmaid dress at 16 weeks that I ordered prior to getting pregnant!). I’m still gaining a very healthy amount of weight, but I’m just making smarter choices. I’m also not giving into every single craving I’ve had– I’ve found that usually a few bites is all I need to satisfy it. If there’s ever been a time to go organic, this is it. Brandon and I had already switched must of our produce and daily staples to organic ones, but I’ve been trying to really step it up. After learning about the pesticides in literally EVERYTHING we eat and realizing that they all add up, and thinking about the little person growing so quickly and depending on you for nutrients, I’ve realized I want to give them the best start I can. Prepping meals ahead of time– even pre-making PB&Js to throw in the freezer, pealing/cutting fruits, or portioning out snacks– will save you tremendous amounts of time, as well as help you to make healthier choices for you and your family. Each week, I made sure to keep up with my menu planning and grocery lists and do what I could on Sundays to prepare for the week while Brandon was home to help me. I also looked ahead at any local activities going on for kids and families, which helped to keep Ben busy and engaged with other kids without as much planning on my (already fatigued) end. Some of our favorite days were spent trying out new playgrounds and activities put on by our library! I’ve been really fortunate to be pregnant during beautiful weather. Getting some fresh air and sunshine totally changes my mood. It’s also great for Ben, who would be outside from morning to bedtime, if I let him! Playing in the rocks or with bubbles keeps him entertained for hours, and wears his little body out for naps and bedtime, which I consider a mom win! Just some chalk, toy trucks, and a bubble mower will provide endless fun without any stress or mess for me, and watching him play and learn is the best part of ANY day. I hope you’ve found this list helpful! Do you have any tips for mamas trying to survive pregnancy with a toddler? (Any third trimester tips? It’s creeping up on me REAL QUICK!) I’d love to hear them! Summer is finally here! After such a long Ohio winter that I thought would never end, it feels so good to have the sun shining on my skin. Ben loves being outside more than anything, and would spend morning until bedtime playing in our backyard, if I’d let him! He’s 18 months old, which is SUCH a fun age. It’s also such an ACTIVE age, and I’ve found that letting him run around outside burns so much more of his endless energy! Compared to last year at this time, when he was practicing sitting up unassisted and would roll everywhere he wanted to go, he is on the move this summer, which has inspired me to create a list of things for his curious little mind to see, do, and learn! As I was typing it out, I realized that we are well on our way to finishing the list already! We have been making the most of the longer days and have made so many memories. What’s on your family’s list of fun things to do this summer? I’d love to hear your ideas! Here are some photos of our summer so far (scroll over each image to read about it)! Playgrounds are his happy place! Nap on the beach? Check! He LOVES splashing in the water! Ben loved meeting a real firefighter and even got to spray the hose! Happy first day of SUMMER! Can you believe we’re already halfway through the year?! I wanted to talk about something I feel parents are always looking for: new healthy snacks. Ben is ALL about snacks… He’s his Mama’s boy, for sure! Several times a day, he asks for “snaaaaaacks!” and will proceed to hand me anything that can hold some treats– cups, bowls, even building blocks turned upside down. My boy sees opportunity in anything! He isn’t picky at all, and his only request is for a food he can feed himself. He’s already so independent in that way. Ben’s happiest when food is involved! I, on the other hand, am a little pickier when it comes to what he eats. He still doesn’t handle dairy very well, so his snacks must be dairy-free– NOT an easy task in the land of convenient toddler snacks of cheese crackers and yogurt bites. I prefer for him to have snacks low in sugar (but still allow him to have an occasional treat, of course), the more natural, the better, and convenience is definitely a plus! I’ve made a list of my 8 favorite dairy-free (& toddler-approved) snacks that will hopefully inspire you with some new healthy ideas for if your kids are as snack-obsessed as mine is! Fresh fruit will always be first on my list. Not only does Ben love them, but fruits like clementines/oranges, watermelon, and bananas are inexpensive, full of nutrition, and are a quick grab-and-go, all-natural treat. Dairy-free yogurt is a newer one on our go-to snacks, but now that I know how much Ben loves them, I try to always keep a few in the fridge. 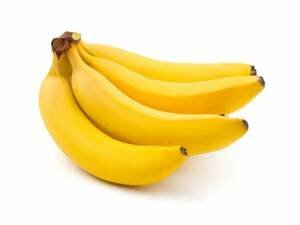 They are a wonderful source of protein and are becoming more popular all the time, so the variety of choices is becoming greater. Our favorites are the SO Delicious CoconutMilk flavors! 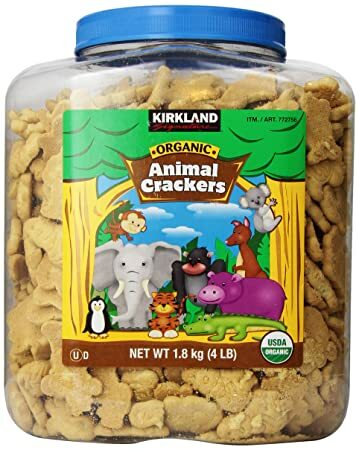 Kirkland Signature Organic Animal Crackers were among the first things we purchased with our new Costco Membership. They come in a gigantic container (seriously, it’s huge! ), which means we run out less often. I usually throw a handful in a container for my purse or car, and Ben loves that they’re just the right size for his little hands. You can also purchase them on Amazon if you aren’t a Costco cardholder. Oyster Crackers are also always in our cabinet as a convenient grab-and-go snack. 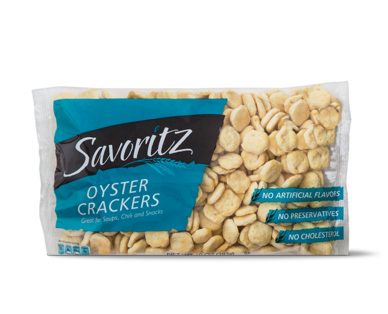 They’re filling, and the Savoritz brand I buy at Aldi are inexpensive ($.79/ 10 oz bag) and have the smallest list of ingredients I’ve seen in any oyster crackers. 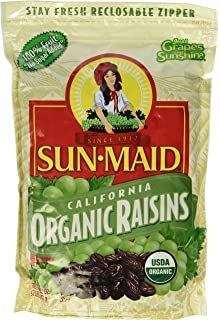 Organic Raisins are Ben’s current most-requested snack lately. He’s been going through so many that I’ve started purchasing them at Costco, too (but can again be found on Amazon)! Since grapes are on the dirty dozen list, we feel better buying these organically. rX Kids Bars are a little more of a splurge snack, but Brandon and I love knowing exactly what’s in them and being able to count the list of ingredients on one hand. Ben thinks they’re delicious and loves being able to feed them to himself. Aldi’s Little Journey Organics Pouches are the best! 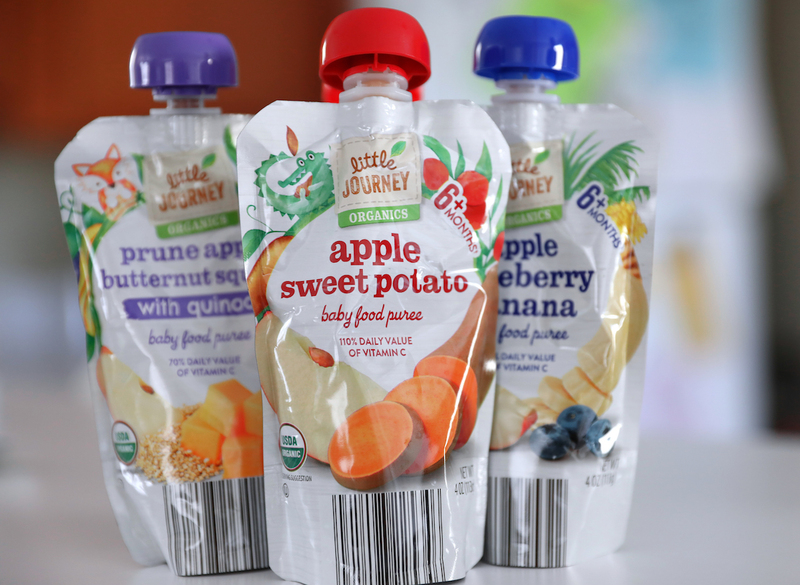 What kid doesn’t love a pouch, and what parent doesn’t love the convenience of squeezable organic fruits and veggies?! These are great to keep Ben from having a hangry meltdown when we are at a restaurant waiting for our food. When he was younger, we would squeeze them out on a spoon for him, but now he loves being able to drink them himself. They are a fantastic deal and have a variety of flavors without added nonsense. Chex Cereal was always a favorite of mine as a kid (heck, I still love them! ), and Ben loves them now. We can pour a few into a cup or bowl and they are a great size for a handheld snack. I hope this list will help you out of perhaps a boring snack slump. My son and I approve of them, so I’m sure you and yours will too! Do you have any dairy-free snack ideas your family loves? We are always looking to try new things! Have a great week, everyone! We are well into the week now, and man, this one really seems to be flying by for me. Anyone else? Brandon, Ben, Jack, & I went on Ben’s first camping trip to a lake about 45 minutes from our house over the weekend. We had heard amazing things about this place, but for some reason, had never been. My goodness, it was so beautiful! We are already excited to go back! We met my parents there, who were camping for the whole weekend. They let us set our little tent up on their campsite, and we were so anxious to make s’mores and something called “Woofem Pies” on the fire. I mean, RAINED. Out of no where, it began DOWNPOURING and hailing. The wind picked up and I don’t think I’ve ever seen it rain so hard in my life! It didn’t take long until we were all completely drenched. Actually, that’s an understatement. I don’t think I could’ve gotten more wet if I was submerged in water. And since the storm was so sudden and unexpected, our tent window was wide open, and it was like we were inviting the water in. Our air mattress almost became a raft that floated away, had our tent not been steaked into the ground. But just as quickly as it came on, the rain stopped, the hail melted, and the sun was out again. We couldn’t do anything but laugh as we tried to wring everything we owned out to dry in the sun. Well, it ended doing that again about an hour later, with another bad storm to follow. Others in the campground were losing their tents, their canopies… everything. No one even saw the storm coming. Pairing that with Ben being SO exhausted but having trouble falling asleep in such a weird place, with a sopping wet dog that is terrified of storms, and the fact that we clearly weren’t as prepared as I tried to be, we decided it was best if we just made a late night drive home to all sleep in our DRY, cool beds before the next storm came. To make a long story short, Ben’s first camping trip was just a long day trip. We are planning a more prepared (and hopefully overnight!) camping trip later this summer, and I will share with you all how it goes! I keep thinking about ‘if Id known, I would’ve done *this* differently’, but I’m trying to stop myself when those thoughts creep up. The thing is, I did the best I could based on the forecast I saw and for our first night in a tiny tent with a baby and a dog. I planned, prepared, and packed, but sometimes, God has other plans. I’m thankful we had an amazing day, we got to see my family, and that the drive was short enough to make it home that night to sleep in our beds. We made some amazing memories, so all you can do is brush it off and laugh! I’m choosing to look at life that way. I hope you all decide that no matter what is going on in your world, you can change your mood if you change your mindset. Take charge of your situation, look at all the good, and turn it into a positive experience! Getting ready for a day on the lake! Jack is the most adventurous dog and is always along for the ride. Ben and my mom playing in the sun. He loves his Grammy! We kicked off our year in the way most parents of 1-year olds do… ASLEEP! Brandon and I put Ben to sleep around 9, popped open some bubbly (sparkling apple juice 😂) while watching an episode of Parks and Rec, and were in bed by 10:30. We still had an amazing New Year’s Day, albeit a cold one here in Ohio. Brandon was off work so we spent the day hibernating and playing with our new Christmas gifts. We also booked our vacation for our 10 year anniversary in May! (Sidenote: I seriously can NOT believe we starting dating 10 years ago and got married 5 years ago this year. Time flies, and the older I get, the quicker the years seem to go.) We decided on a cruise, which is what we did for our honeymoon and it was amazing. It will be a whole new kind of fun with a toddler on board, and we are so excited to make vacation memories with him. I’ve been doing some research on taking toddlers on cruises. (Have you guys done it? I’d love to hear your advice!) The cruise being booked is also giving me some motivation to get back into working out, which I’ve neglected doing due to the cold and winter blues. Ben has been CRACKING us up lately with his adorable personality. He is so independent and fearless, which is enough to keep this mama on her toes! He’s figured out that if he climbs Jack, he can get up onto the couch or coffee table. It’s like an undiscovered jungle gym up there! He’s also learned how to shake his head no, which he uses very freely and appropriately when we ask him to eat foods he doesn’t want to, or to get down from the coffee table. We’ve been taking him to play areas more to get some energy out, and he loves playing with the other kids. He’s the sweetest boy, always smiling, sharing, and curious. We took him sledding for the first time after getting several inches of snow. He was NOT a fan of the cold, or maybe it was the dozen layers we bundled him up in. He could hardly move his arms and he kept tipping over from the weight of his coat and snowpants, which made him pretty upset, so we didn’t stay long. We’ll try again next year! Any time we go to the store, Ben loves to wave and blow kisses to everyone, making friends wherever we go. He also knows lots of body parts and points to them when you say their name. He fake coughs and fake laughs, and it’s the cutest. He loves making others laugh, and I wouldn’t be surprised if he was the class clown at school one day. He is the best boy at naptime and bedtime, and I’m so grateful. He will roll over and put himself to sleep in his bed. I couldn’t be more proud of the little boy he’s becoming. We’re having a great month here, and if it’s any sign of what’s to come for the new year, I think we are on a great path! Thanks for reading! 33 weeks with my babies 😘 Life has been B U S Y lately, but goodness, it's been so, so sweet. Soaking up this season with my boys before we become a family of four 🎀 . . I'm ready when you are, and we can't wait to meet you, Sweet Girl!